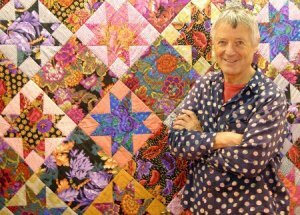 If there was one word to describe artist and designer Kaffe Fassett’s work, that word would be color. Kaffe, who is based in London, could be called a renaissance designer because of the many forms his artistic creativity takes him. Among other things, Kaffe is known worldwide for his line of designer fabric collections, needlepoint patterns, mosaic work, patchwork quilt motifs, knitting patterns, oil paintings and original rug designs. He’s often featured in magazines and on television shows, and is a popular teacher and instructor throughout the world. Kaffe devotes a substantial amount of time to promoting the use of beautiful bright colored fabric, fibers and paints. At Island Quilter, we love the fresh and vibrant feel of the Kaffe Fassett Fabric Collection, and have created the Kaffe Club to celebrate it. Learn about this exciting program by clicking here.